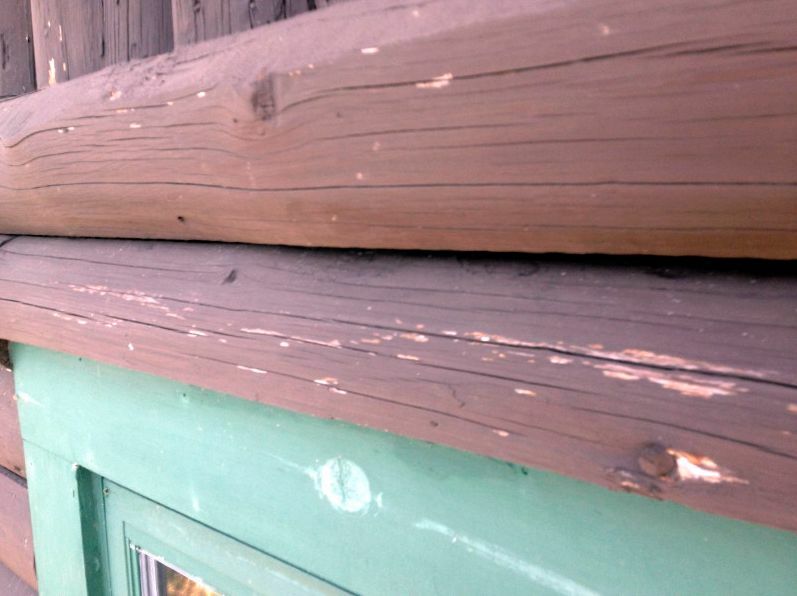 Is the stain on your log home peeling, darkened, or fading? 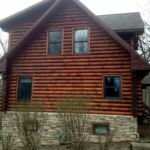 Log homes require routine maintenance of the exterior stain/finish. 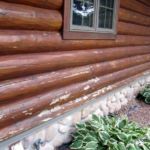 Once the stain starts to deteriorate, it’s time to determine the right course of action to make sure that the logs are protected from the elements. 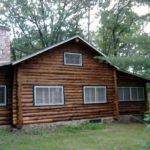 Staining your log home on a regular basis is important to keep your logs protected and to make sure your log home looks it’s best for years to come. Though it may not be noticeable, logs do get dirty and can develop mildew if not properly maintained. For the most part, stain maintenance entails cleaning the logs and applying a new coat of stain. 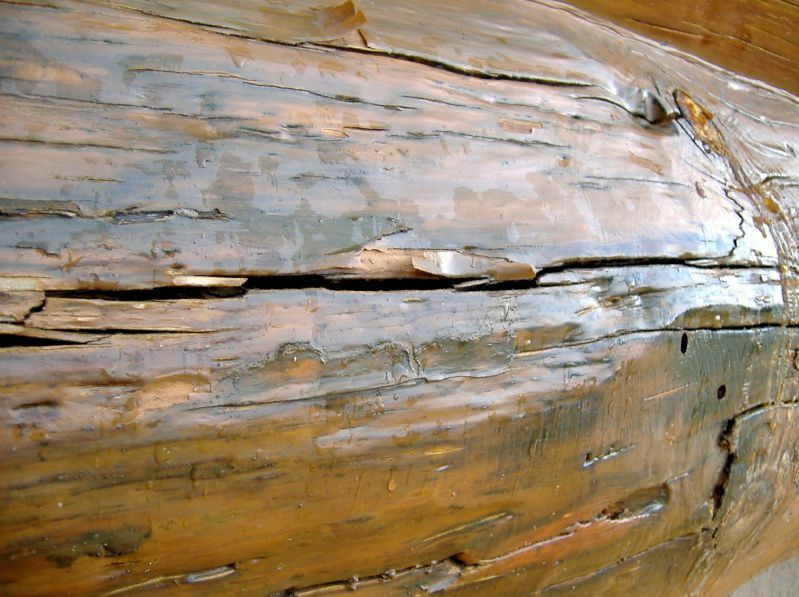 To maintain a good stain on your logs, most homes need to be re-stained about every three to five years. Darkened and flaking stain and log paint can come in many forms. See many examples in this gallery. Failing stain can lead to rot before you know it. In this example, the stain has deteriorated to the point that it needs to be completely removed so that a fresh coat of stain can be applied. These logs have darkened and are in need of a good cleaning and another coat of stain. 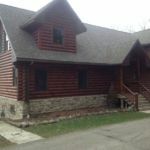 This home needed the logs cleaned before staining. After a thorough cleaning using a non-chlorine cleaner and staining, look at the difference – the facelift is completed. Notice the difference where the dark, old finish has been blasted off. Even before new stain has been applied, this place is looking better. 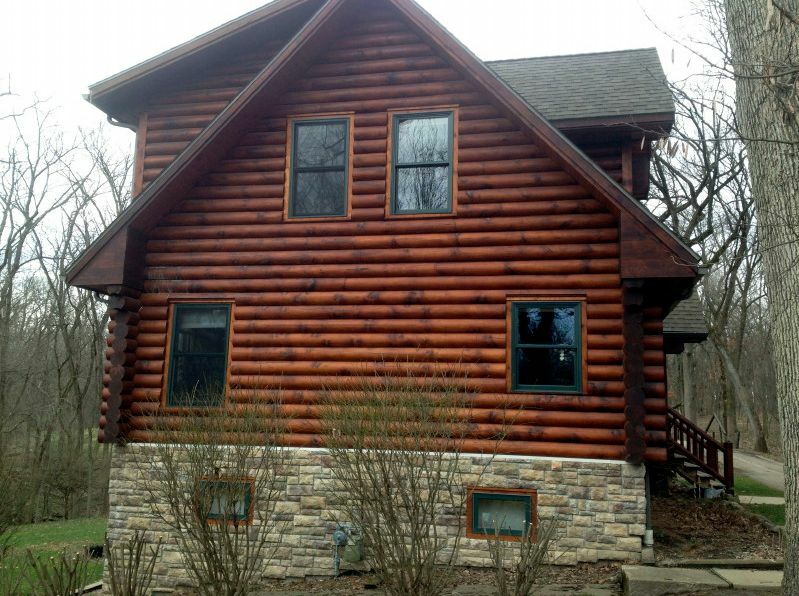 All the dark, old stain is removed and the new stain gives this log home a fresh and clean look. 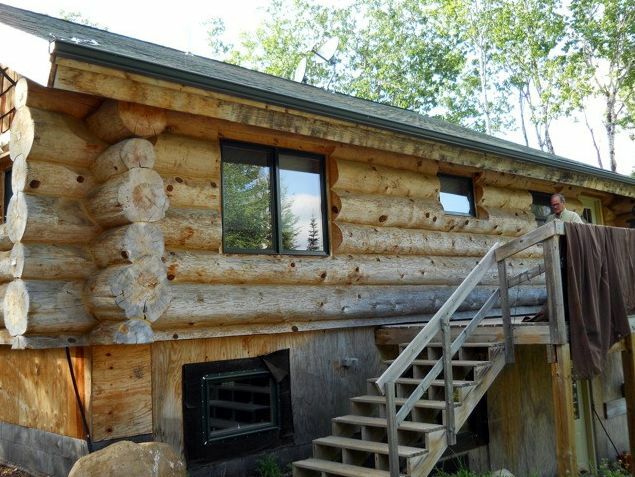 Keep your log home looking great. It goes a long way towards maintaining its value. Keep an eye out for problem areas such as darkening color, pealing, thin or no stain at all in certain areas. Peeling stains can become a major problem. It makes for an unstable surface and impedes new stain from adhering well to the logs. If you see this… its time to have the stain removed, i.e. blasted off, and start over with fresh wood. 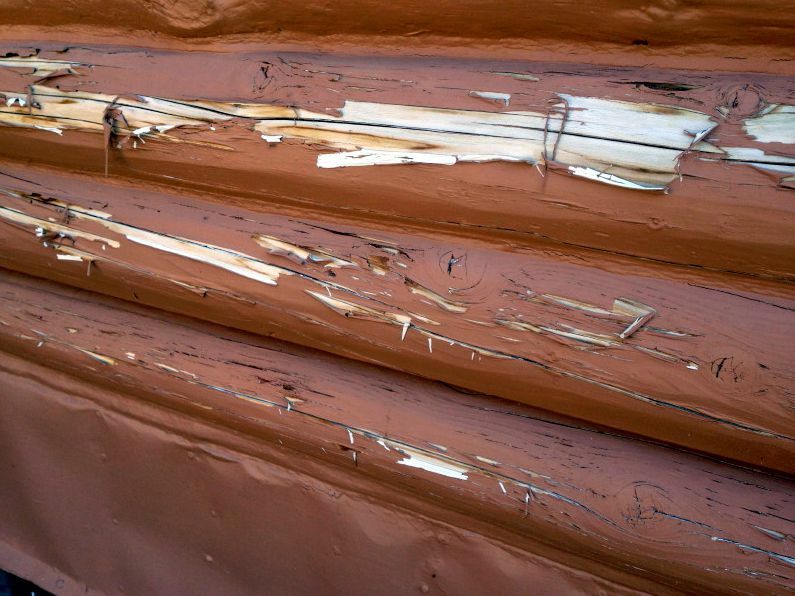 Some log homes have actual paint on them vs. stain. 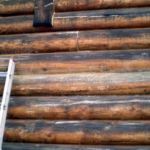 Paint does not allow the logs to breath and can lead to problems with rot. 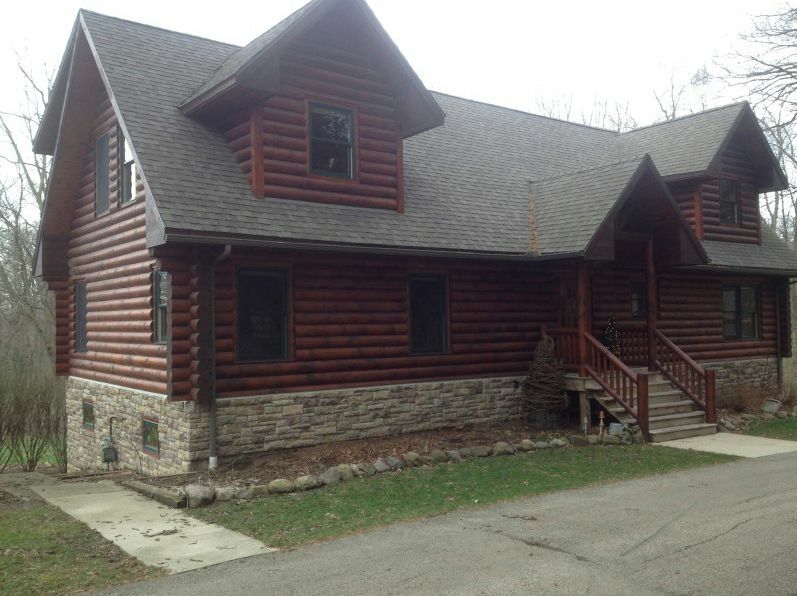 Paying attention to the condition of your log home stain is one key to good maintenance! 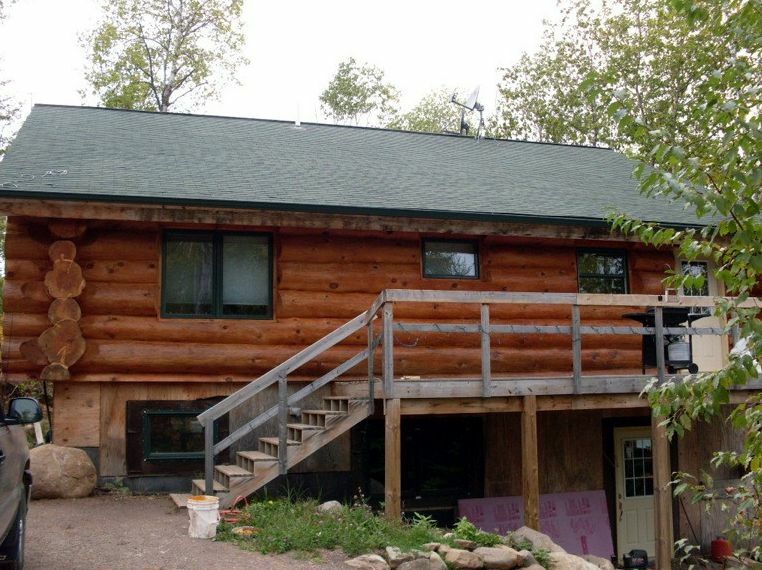 Overlooking this can lead to log home repair vs. routine maintenance. Clean the logs every year, if possible. Over time, buildup of dirt and pollen on the logs will shorten the life and protection capabilities of your stain. “Best practice” recommendation is to clean the logs with TSP brand cleaner, using a stiff bristle brush and low-pressure water from a garden hose. Do this routinely to maintain a lasting finish. Assess the condition of your stain. To determine when to re-stain your logs, you need to test your stain’s ability to repel moisture. Does water still “bead up” on the surface of the wood? Test this by using a garden hose or a small spray bottle. If the logs soak up the water – they need to be re-stained. Look for problem spots such as faded/darkening areas, moldy spots, wet areas, and leaking gutters. These are indicators that you may have problems. Depending on the severity of the problem, you may need to blast off your current finish and start over. For more information on blasting, click here. Edmunds & Company provides a full range of services related to finish that is failing. 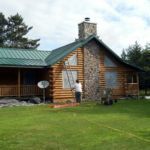 Whether your log home needs re-staining or more in-depth refinishing services, we can restore the beauty of your investment – your home. Even when finish is faithfully applied according to the manufacturer’s instructions, problems can still arise. 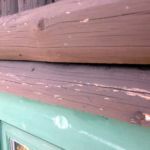 Moisture begins to build up behind the finish and may cause the log to rot. 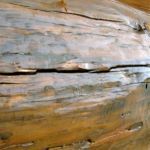 Too much finish can form an impermeable layer on the surface of the log, making it difficult for the logs to wick out the moisture. 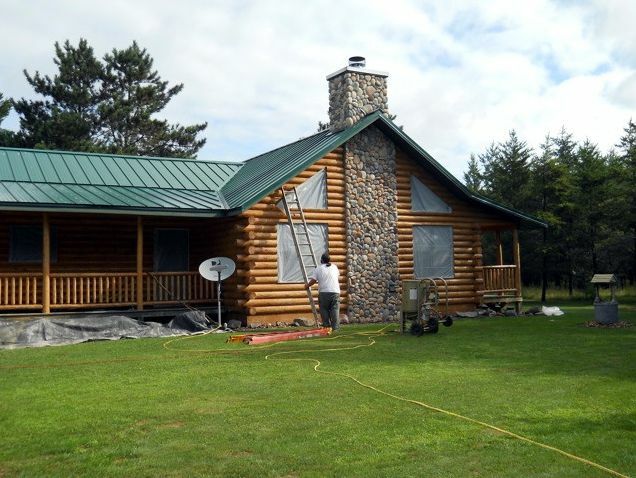 Log homes and cabins require routine maintenance, which includes re-staining. Over time, layers of stain can build up, causing the logs to rot. 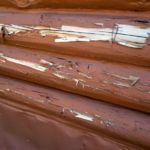 It is not always obvious to the eye, but a trained professional can spot rot even from a distance. Sometimes we see buildings with this type of finish build up when they are less than ten years old. 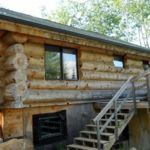 In the case of newer homes like these, the logs have a relatively high moisture content to begin with (new logs are often green), which is compounded when a “film building” finish is applied. Problems can arise after even the second or third coat of this type of finish. 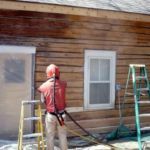 Our experience has shown that many of these buildings start off with a finish that is breathable enough, but once the second or third coat is applied, the finish becomes too thick (buildup) and forms a barrier to the log breathing. 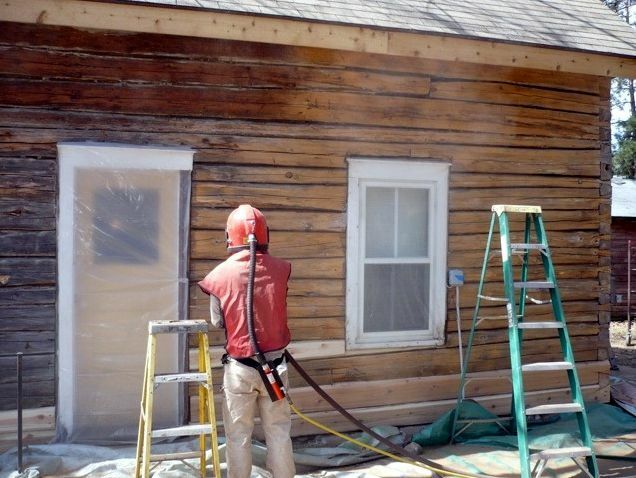 It is very common during the lifespan of a log home or cabin to have the old finish removed and a new one applied. The technology for what constitutes a quality stain continues to improve and what was once considered to be the best no longer works well. Sometimes the best course of action is to start over with fresh wood. Repair any damage that has occurred, i.e. log replacement, if necessary. 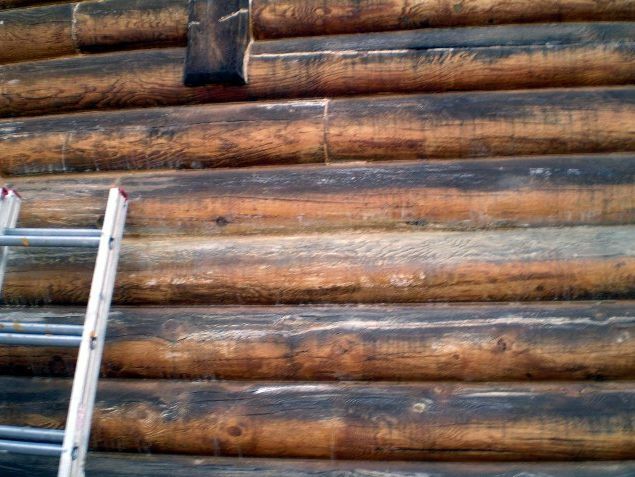 Address the buildup of finish on the logs. Most times this means getting rid of the current finish through blasting. 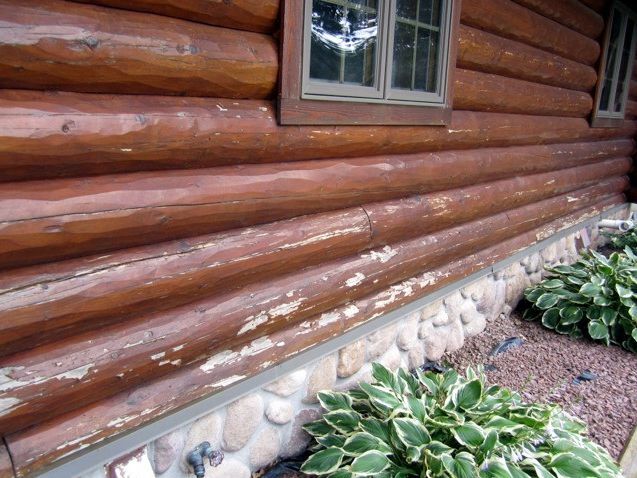 Apply a borate treatment to help protect the logs from future rot. 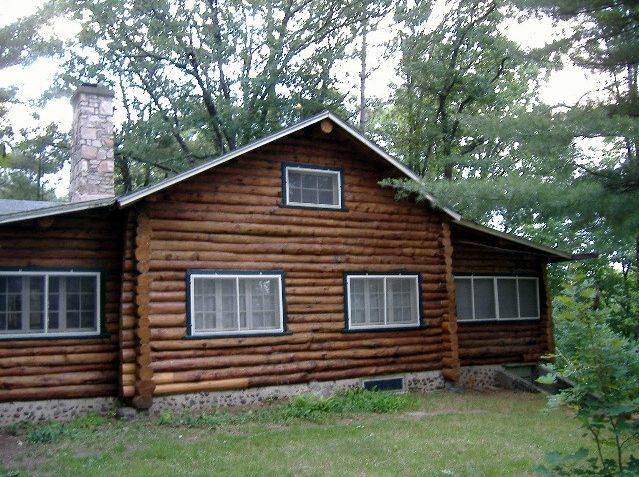 Apply a quality log home stain. 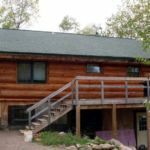 Log homes – cleaning the exterior logs is a good thing. What is the difference between re-staining and refinishing? Click here to find out more.